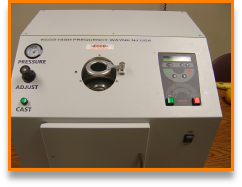 ECCO manufactures a full line of induction casting machines. The DCM series machines are suitable for typical Dental casting, while the JCM series are suitable for the Jewelry industry. We are your OEM source for ECM 1, M69 and ECM 3 parts. Ecco deals in Refurbished models of these units as well. Please call for availability. The MiniCast combines the best features of a large floor model with the convenience of a bench top unit. This versatile machine can cast crown and bridge, as well as partials. Capable of precious and semi precious metals. 208-240Vac, single phase, 25 amps. Buy for as low as $293 per month*. Call us for details. * For qualified buyers, rates may vary slightly. First payment due at signing. The ECCO UltraCast casting machine uses both vacuum and pressure to cast all alloys including Titanium. The Vacuum and Argon atmosphere provide clean casting, and uses NO CRUCIBLES. The ECCOCast Model D2 is the new work horse of the modern dental lab. This unit incorporates all basic reliable features of the old M69 and ECM durable solid state power supply on the market. Let our seven decades of experience process your cases with the touch of a button. Fully automatic this unit will do it all, simply start the cycle and remove the case when the machine finishes. 208-240Vac, single phase, 20 amps. Buy for as low as $407 per month*. Call us for details. * For qualified buyers, rates may vary slightly. The ECCPCast Model D6 combines all the reliability of ECCO casting equipment, with the added convenience of a self contained unit. 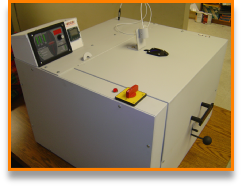 This machine incorporates the latest in induction technology with a 12 gallon water tank. Simply fill the tank plug in the machine and your ready to go. Crown and bridge, cast partials, all alloys. For more information, please contact our sales office. 208-240Vac, single phase, 25 amps. Buy for as low as $370 per month*. Call us for details.